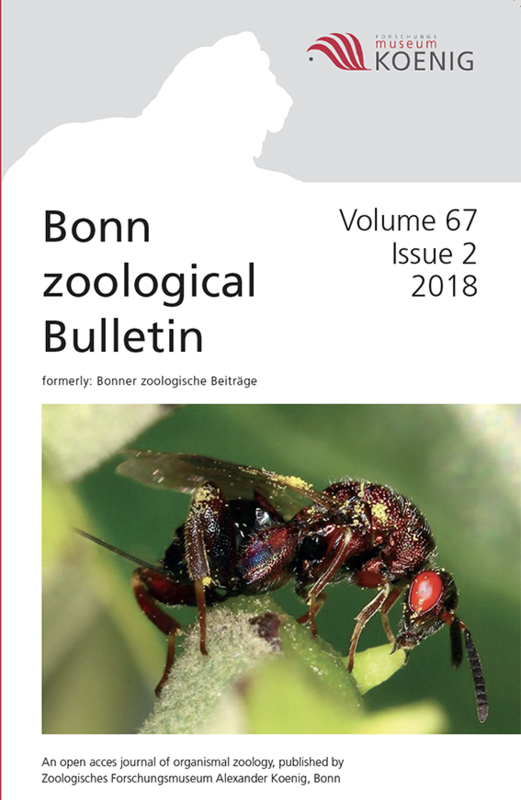 The Bonn zoological Bulletin (BzB), formerly "Bonner zoologische Beiträge", is an international, peer-reviewed, open access journal publishing original research articles, reviews, and scientific notes dealing with organismal zoology. Focus of the BzB are (1) taxonomy, (2) systematics and evolution, and (3) biodiversity and biogeography, all with respect to terrestrial animals. Terrestrial animals as understood here include those inhabiting fresh or brackish waters. Contributions from related fields like ecology, morphology, anatomy, physiology or behaviour are welcome when of clear relevance to the focus topics. From 2012, a regular “Supplement Series” publishes comprehensive single papers, monographs and theme issues, in addition to the two annual volumes of BzB. The “Supplements Series” is the replacement of the “Bonner zoologische Monographien” (“Bonn zoological Monographs”), which had published monographic work since 1971. Thomes Wesener, curator for millipedes (Myriapoda) at ZFMK, manages the “Supplement Series”. For further information, please see the point “Supplements”. Open Access: Free access to all pdfs, back to 1950!